“When I was drawing up my design for Duravit, the image in my mind’s eye from the very start was a bowl filled with water on a simple table,” said the Danish designer Cecilie Manz. This image inspired Duravit’s Luv bathroom series, which affords brand new design opportunities for larger rooms or guest bathrooms. Luv’s unusual design combines Nordic purism and timeless elegance. Gentle forms follow a sharp geometry. The selection of materials and colours is testament to Cecilie Manz’s refined sense for nuanced form. Her colour palate of matt lacquers and glazes in soft shades was developed exclusively for Duravit and emphasizes the fresh character of Luv. Three sizes of oval above-counter basins made from DuraCeram® impress with their subtle lines, generous inner basins, and clean edges. On the variants with an incorporated tap hole platform, the tap fitting is mounted centrally at the rear, and on the small handrinse basins it is fitted on the left or right side. The optionally glazed exterior is available in satin matte White, Grey or Sand. This contrast with the glossy white glazed inner basin produces unique pieces with a special look and feel. Ceramic drain covers complete and overall harmonious look. The washbasin stand consists of a console table on four gently curved, height-adjustable feet. Using this unique design language, Cecilie Manz skilfully realizes the original image of a table and water bowl. Three widths are available: 1788 mm for the double washbasin, 1388 mm for the single and 688 mm for the guest bathroom. Lacquered in satin matte and available in white, Nordic white, taupe, stone grey, light blue and night blue, the console tables contribute significantly to the feeling of space. Quartz console panels in three perfectly harmonized colour variants and a solid-wood version in American walnut can be combined as desired by the customer. Storage space is available in the form of handle-free pull-out compartments and drawers, conveniently fitted with tip-on technology and self-closing mechanisms. Luv also offers no-nonsense bathtubs that are based on the shape of the wash bowls. Seamless, and made from DuraSolid A, they offer a pleasantly warm feel and high-quality matte look. They are available in free-standing, back-to-wall and corner (left or right) versions. As a special extra, the bathtub can be equipped with a discreetly integrated air whirl system (exclusive to the back-to-wall and corner version), or with an integrated sound system which can be operated using any Bluetooth-compatible device. Founded in 1817 in Hornberg in the Black Forest, Duravit AG is today a leading international manufacturer of designer bathrooms. The company operates in more than 130 countries worldwide and stands for innovations in the field of good design, the intelligent use of technology and top quality. In cooperation with high-profile international designers, such as Philippe Starck and EOOS, the company develops comfortable bathrooms that really enhance quality of life for users on a sustained basis. 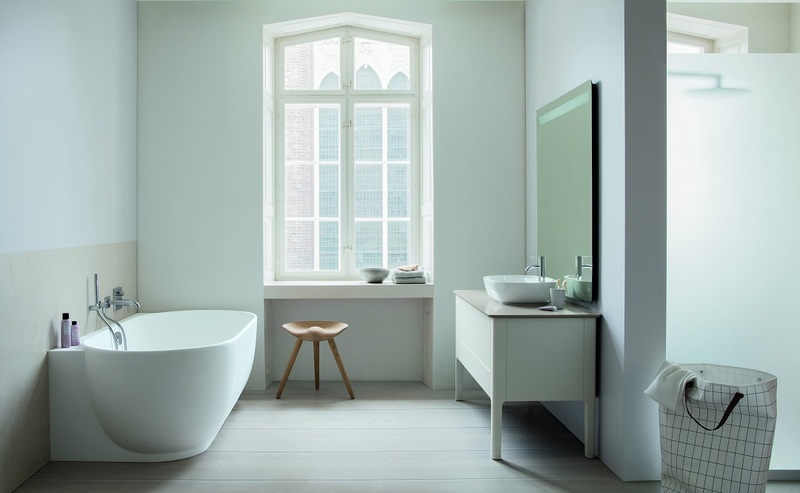 Duravit’s product portfolio comprises sanitary ceramics, bathroom furniture, baths and shower trays, wellness systems, shower-toilets, faucets and accessories.